Successful dental implant treatments require education, training, and extensive experience by a dental implant expert. Every patient presents its own unique dental condition. To find out how best you may benefit from dental implants, your condition should be carefully evaluated by Dr. Khazian. This evaluation includes, but is not limited to: number and location of missing teeth, the jaw bone condition, your overall health condition, esthetic considerations, the health of your gum, the condition of remaining teeth, the condition of your jaw joints (TMJ), the position of nerves and blood vessels in relation to implants, and more. You may take advantage of our free consultation, have your specific condition evaluated by Dr. Khazian and review your treatment options. We understand that having dental implant treatment is a major decision, and the first and foremost factor for you is to have confidence in, and be comfortable with the team that will provide this treatment. During your one hour free consultation you will meet Dr. Khazian and his excellent team. Necessary x-ray will be taken at no charge and Dr. Khazian will initially review your condition and present different treatment options. These options will be discussed with you in detail and your questions will be answered. A cost estimate and financing options will also be presented to you during this visit. During this visit our goal is to provide as much information as possible, so you may fully understand your diagnosis and treatment plans. We believe an informed and educated patient is in a better position to cooperate during the course of treatment, and will help achieve expected results. Please bring all your questions to be answered by Dr. Khazian and/or his team. If you are more comfortable having a friend or relative with you during this consultation visit, you may bring one along. If you choose to proceed, you may be able to start your treatment the same day. Many of our new patients do so after having this comprehensive visit with Dr. Khazian. Dental Implant Centers is the leading provider of comprehensive treatments for dental implants in San Diego. 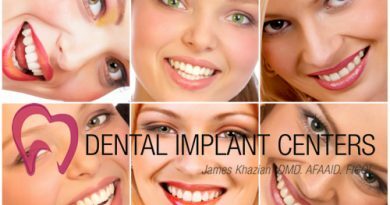 Dr. Khazian has been on the cutting edge of modern dentistry, and has extensive training and experience in both the surgical and restorative phases of implant dentistry, as well as cosmetic dentistry. All your treatment will be done by Dr. Khazian and his team, with no referral to other doctors. This will assure a smooth and fast treatment process, and eliminates all the confusion in dealing with 2 or 3 doctors. Dental Implant Centers offer the healthiest and most intelligent treatment solutions. We provide the most comprehensive treatments for dental implants in San Diego. Both surgical and restorative phases of your dental implant treatment are performed by Dr. Khazian. There will be no referral back and forth to another doctor or office.